Growing up just south of Sarnia, Ont., I watched the famous railway cat Chessie breeze through my hometown along CSX Transportation's Sarnia Subdivision. The line was an oddity by most standards, although I wasn't old enough to appreciate it. 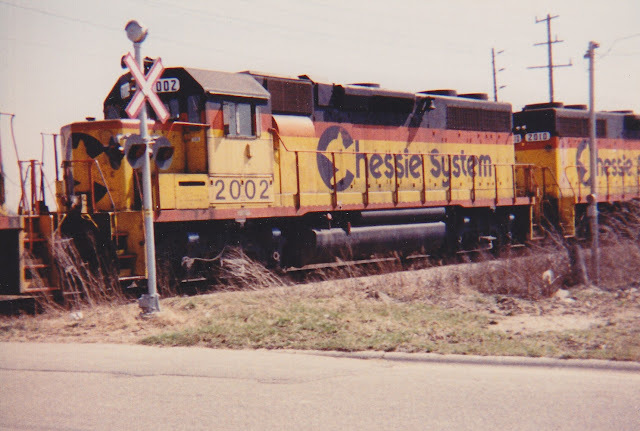 The most obvious oddity was the ongoing use of Chessie System-painted locomotives well into the 1990s. 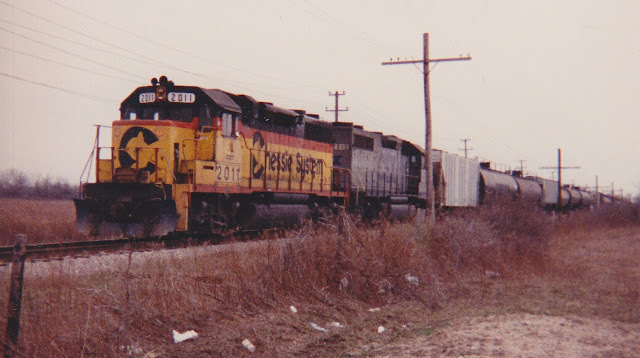 The Chessie livery lived on elsewhere in the CSX network long after the Chessie-Seaboard System merger, but the cat seemed to persist much longer on the Sarnia Sub. No doubt these units were left in the Chessie livery as a cost-saving measure. At one point, the sides of the cabs were repainted to with the CSXT reporting mark instead of C&O, B&O or WM identifiers, which the Chessie System used on its units after the Baltimore and Ohio, Chesapeake and Ohio and Western Maryland railways were brought together under the Chessie System umbrella. When I was growing up, I used to think the Chessie colours were something akin to the old Houston Astros uniforms. In other words, I thought they were gaudy and downright ugly. Looking back, I'm glad I took photos of those units, which were usually paired off in twos. The Chessie geeps shuttled tank cars, hopper cars, auto racks and boxcars to and from Chatham, Ont. and Sarnia, Ont. The frequency of the trains was low, with one heading in each direction once a day and sometimes two at most. The density of traffic on this single track line was light enough that there was no signal equipment on much of the right-of-way. Besides the Chessie engines, the line also featured a number of other throwbacks like two types of cabooses that were in use well into the 1990s, long after most cabooses went the way of the dodo. There were also several pre-World War II wooden boxcars and crew cars lingering on the line into the 1990s. Perhaps the most interesting relic was a Baltimore and Ohio-painted GP-38 that was used on the line during this time. More on all of these in future posts. The Sarnia sub is still operational today. The line meets up with the Canadian Pacific's Windsor mainline in Chatham. It once ventured all the way south to Rondeau Point on Lake Erie before that section was abandoned all the way up to Blenheim. A small section in Blenheim was sold to CN and remains in service. At the north end, the Sarnia sub finishes in the Chemical Valley, where it interchanges with the Canadian National. The line was completed in 1886 as the Erie and Huron Railroad. In 1902-03, it became part of the Pere Marquette system, which itself became part of the Chesapeake and Ohio in 1947. The line once carried passengers, as evidenced by this former passenger station near the end of line in Sarnia (left). This station is hidden behind a refinery in the Chemical Valley at the end of Clifford Street. The old station acted as a railway office for years. I haven't been by there recently, so I have no idea what has become of this sad old building. There isn't much else along this line that serves as a reminder of its past. 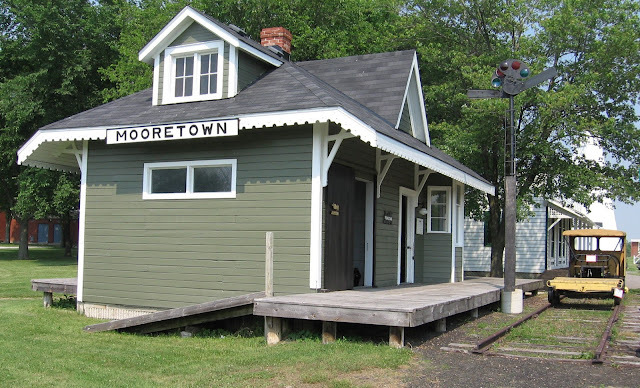 However, south of Sarnia in the riverfront community of Mooretown, the old railway station has been preserved along with a speeder on the grounds of the Moore Museum (below). Although this sub continues to operate sporadically, there has been chatter for years that CSX wants to abandon this line. If it does, it would mark the end of the railway's presence in Ontario. CSX still has trackage rights in Windsor and a branch in New York State that stretches up to Melocheville, Que. Other than that, the Chessie cat has all but disappeared in Canada, as you can see on the CSX system map. I guess age changes your perspective because I don't find the old Chessie colours so bad anymore. I was lucky to have caught up with the Houston Astros of the railway scene and grabbed a few images like this one when I had the chance (below). while waiting for switch jobs to clear the main track. NOTE: If you are new to the Beachburg Sub, I would invite you to read the first post to get a primer for this blog. Thanks for sharing those memories. I am too young to have witnessed what you saw, but I always consider the late 1960s-1970s as a era in railroading that I would have loved to see. CASO was a line with lots of colour and lots of history. It's a shame all that are left are memories. My father served Chessie System for 33 years operating out of the St. Thomas Yard, and the Sarnia Yard after St. Thomas shut down. 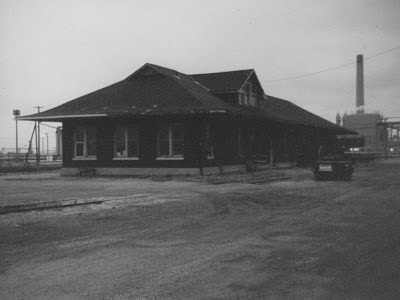 I spent my childhood playing in the old train station photo you posted of the Sarnia Depot. I played all over the Engines, and the old man even took me out on his engine a few times. I loved those trains. Thanks for the walk down memory lane with this. Thanks for sharing your memories, Wayne. Feel free to search around for more Chessie posts. I have written a bunch about that railway down in Sarnia. I only wish I could have seen its operations in St. Thomas back in the day. Very cool wrire up. I lived 5 mins from the St. Thomas shops growing up. Wish I had taken more pix and spent more time there.